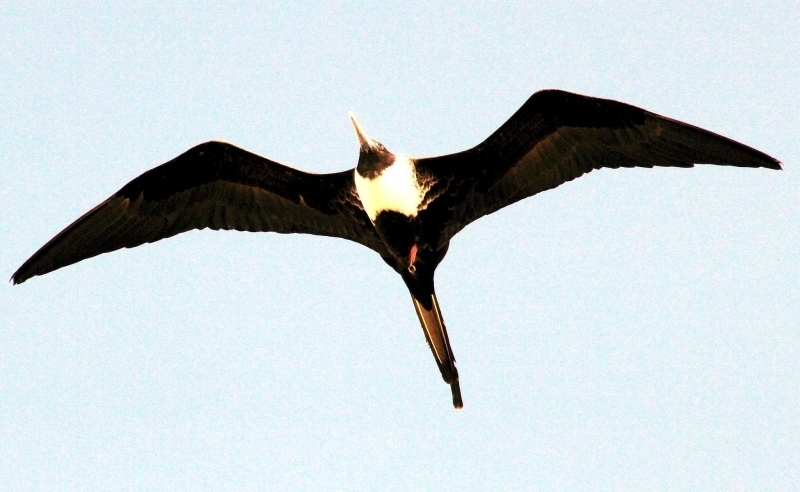 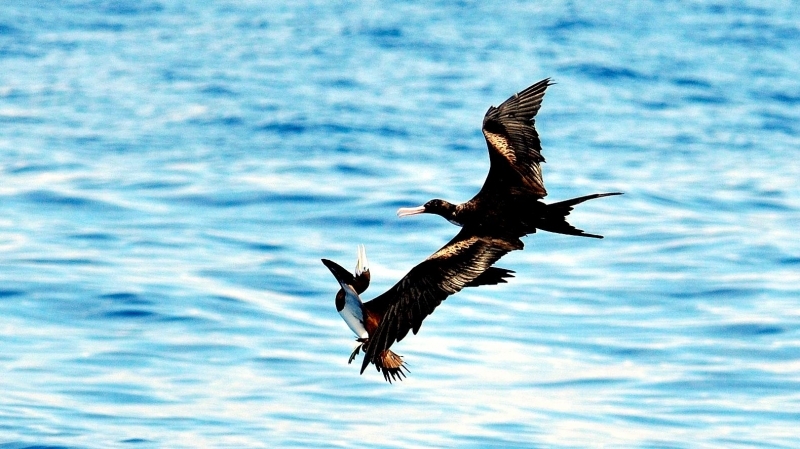 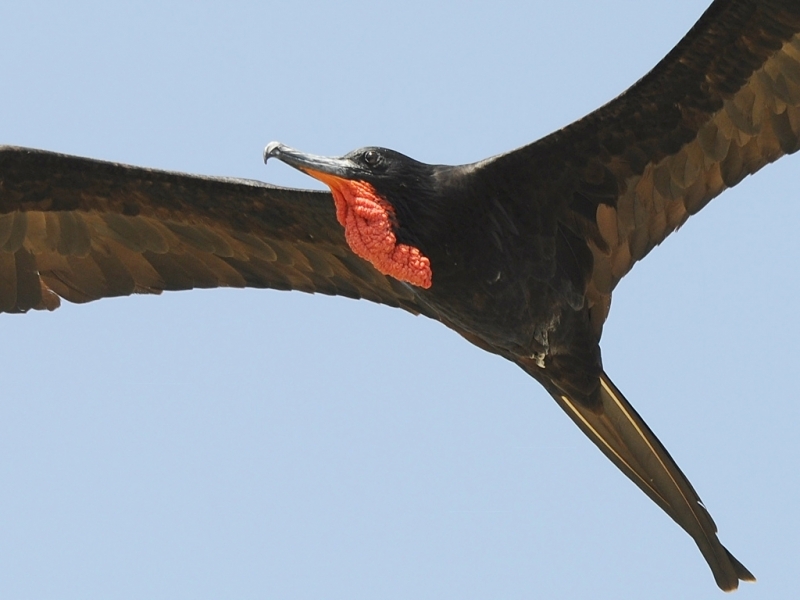 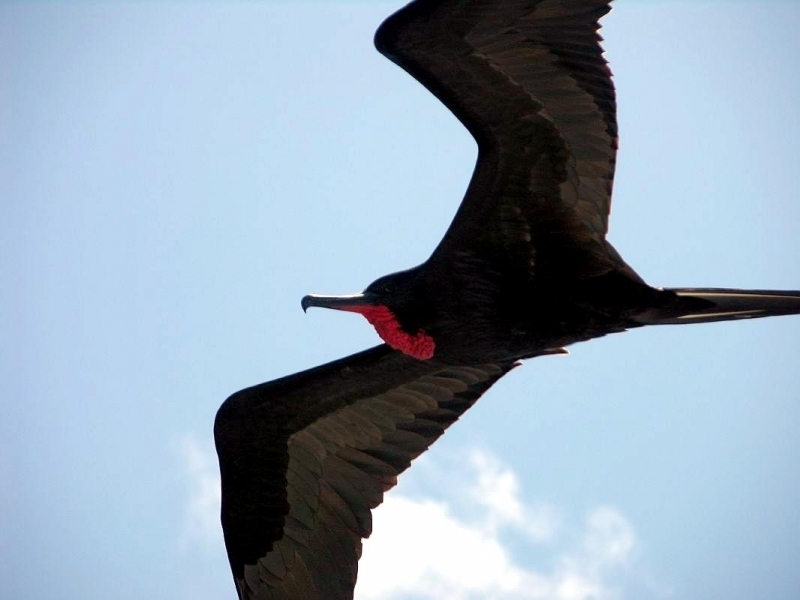 The Magnificent Frigatebird is a large bird (90 inch wingspan) and a wonderful glider. 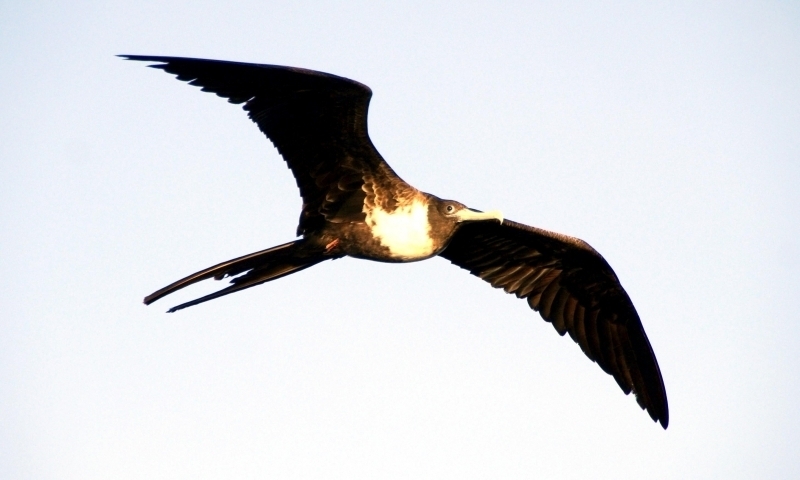 The wings are narrow & pointed and the tail is long and forked. 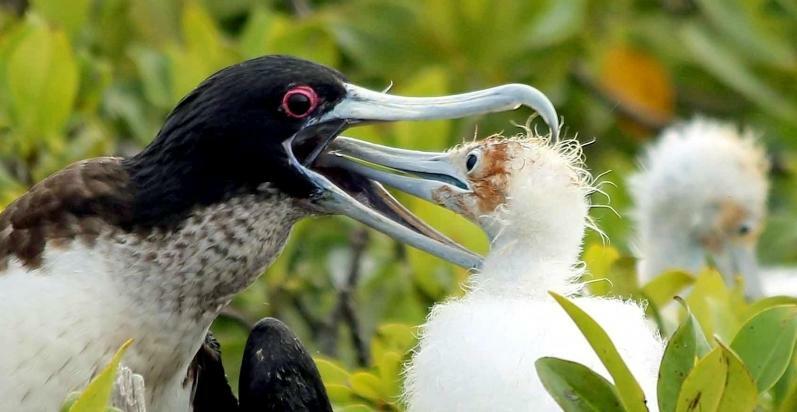 The bill is long and hooked. 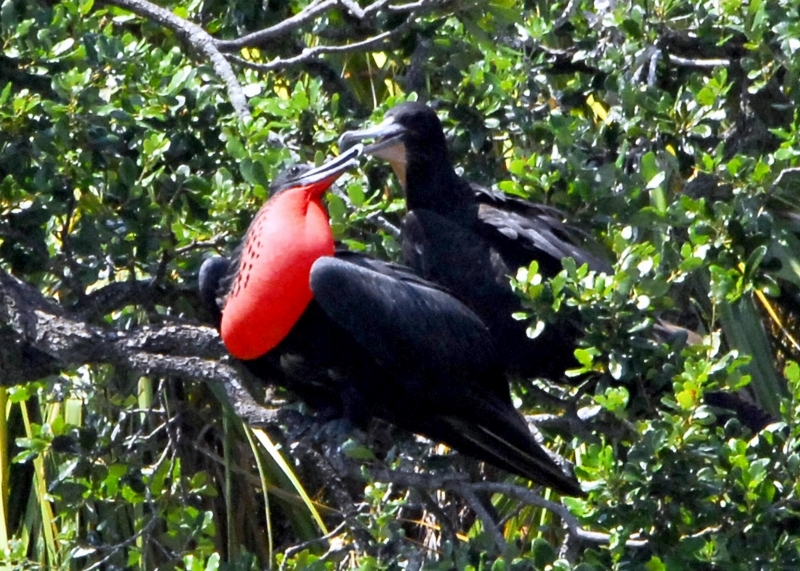 The adult male is all black with a red throat sac that is inflated during courtship. 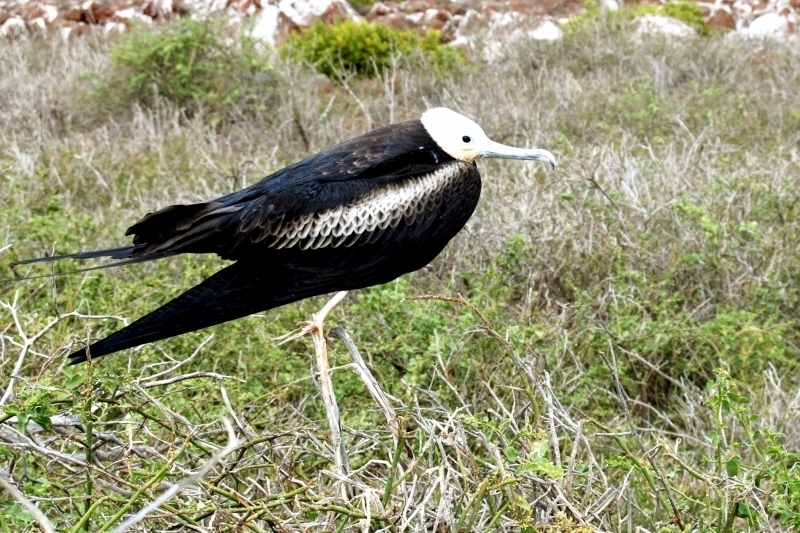 The female is also black with a white breast and the toes are webbed. 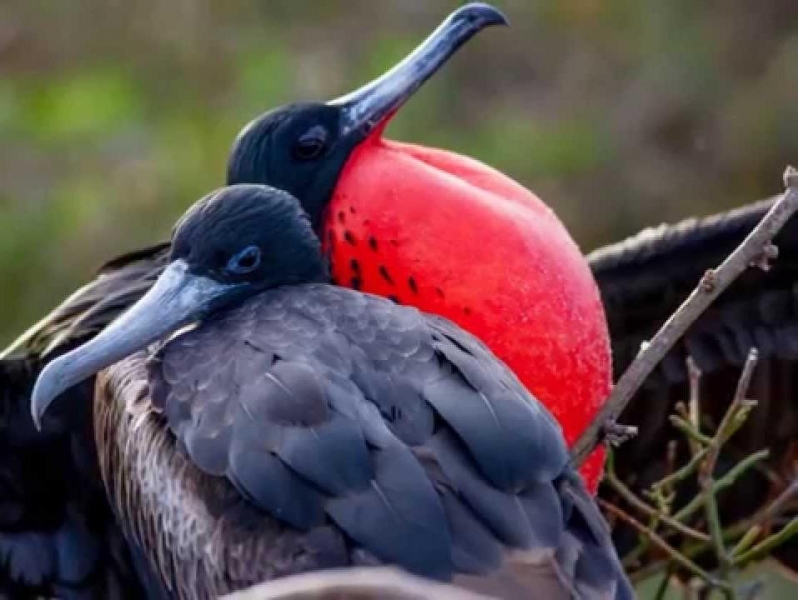 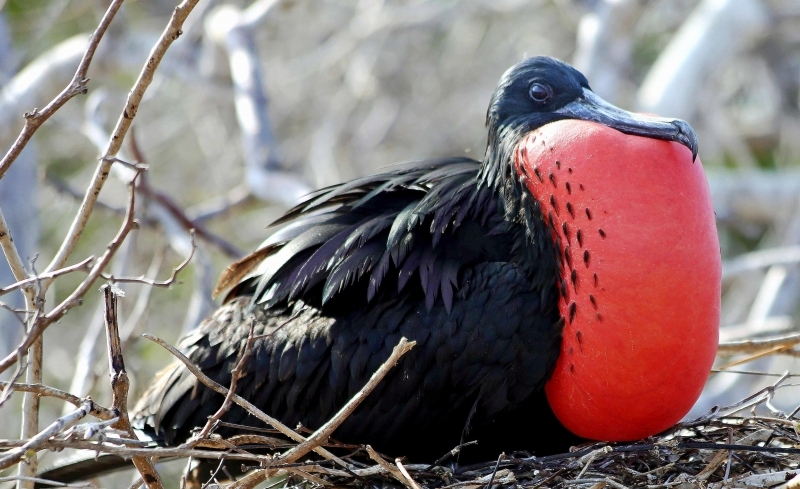 The Magnificent Frigatebird is also known as the Man-of-War Bird and the Piratebird, is a species of seabird found in warmer, tropical regions. 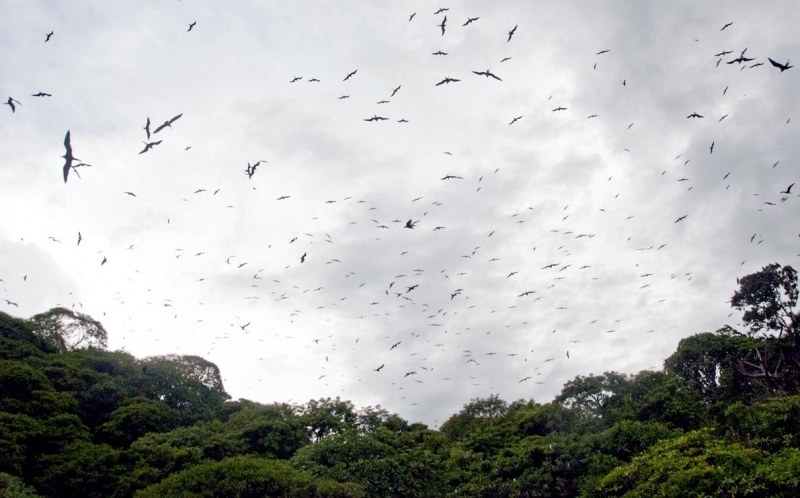 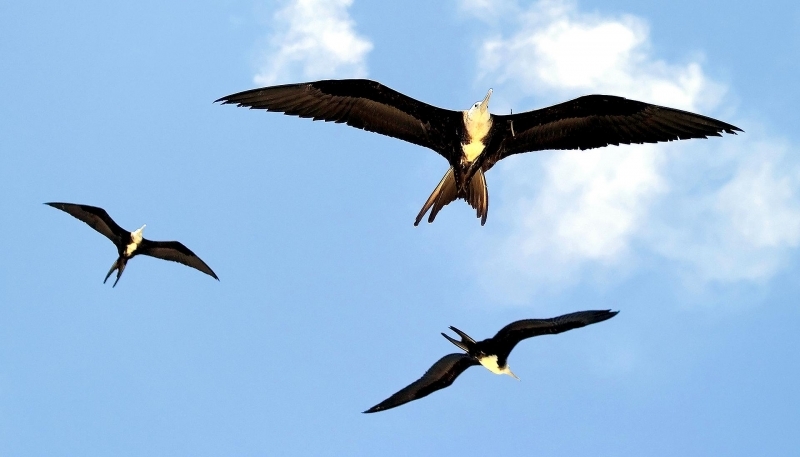 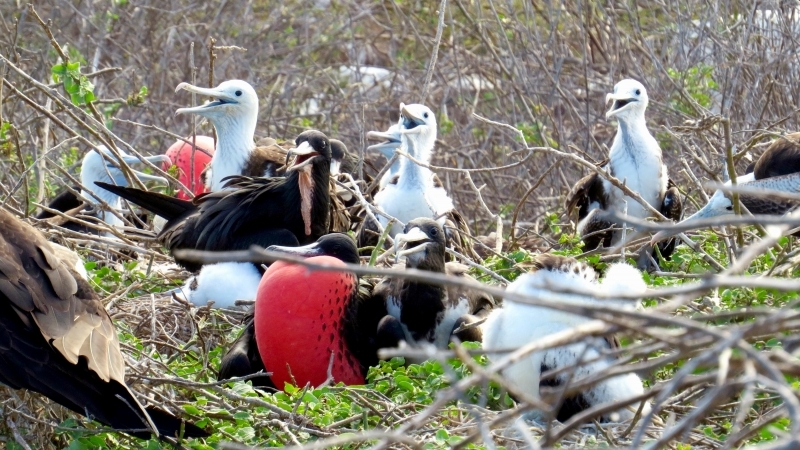 Christopher Columbus encountered Frigatebirds when passing the Cape Verde Islands on his first voyage across the Atlantic. 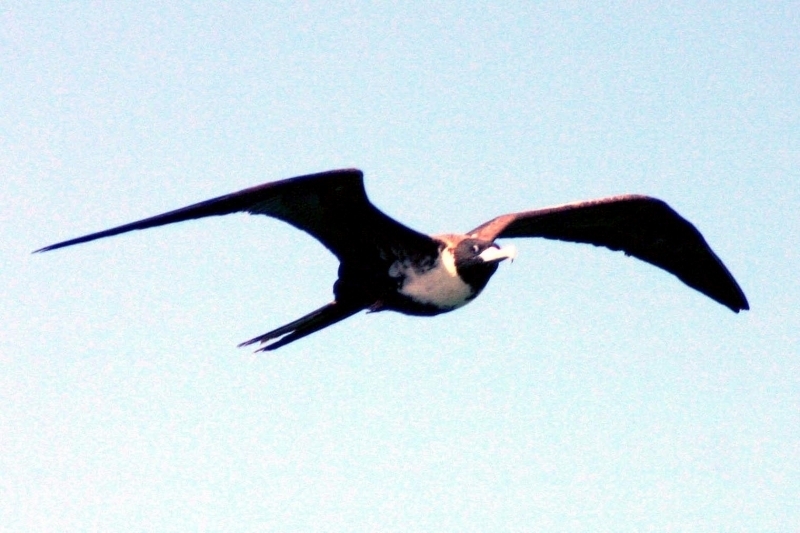 In his journal entry for September 29, 1492, he used the word “rabiforçado”, modern Spanish for “rabihorcado” or “forktail”. 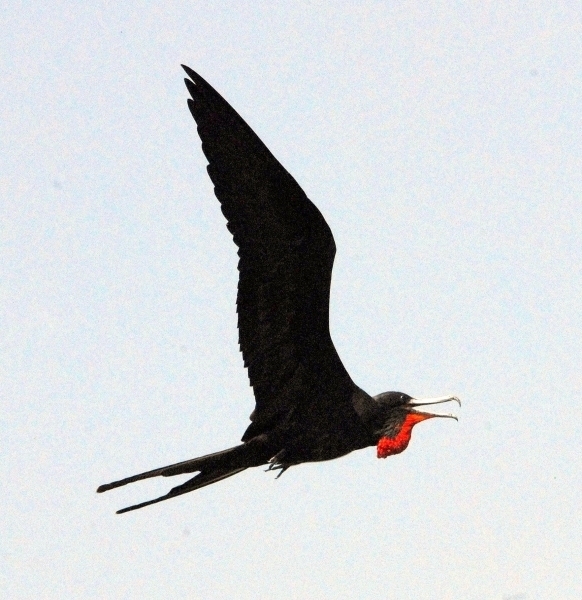 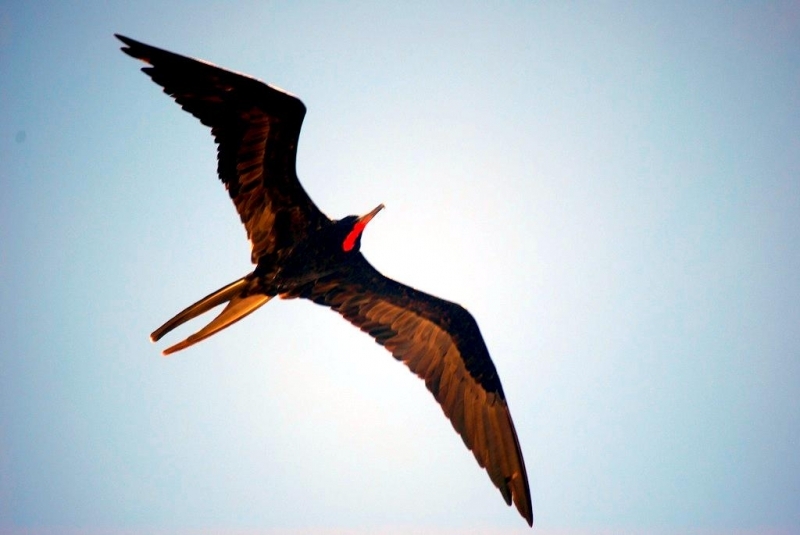 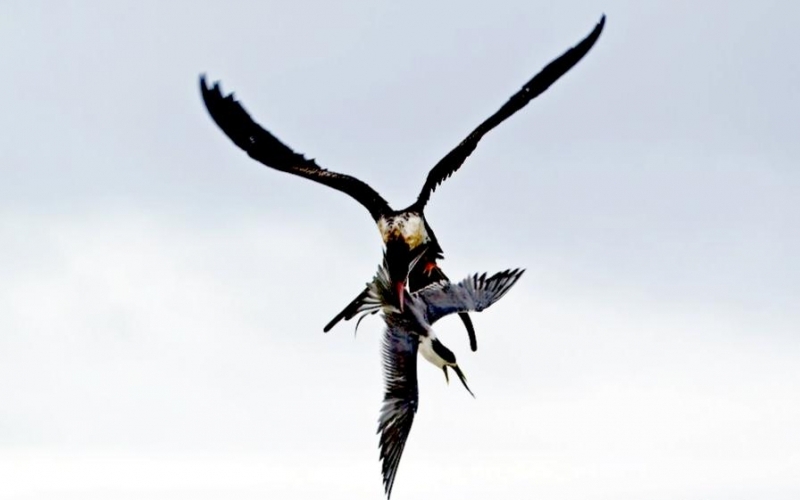 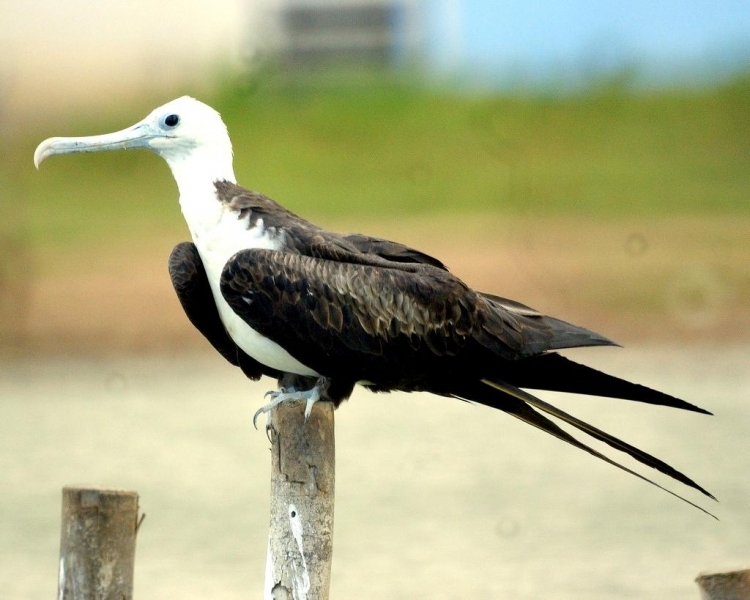 The word “frigatebird” is derived from the French mariners’ name for the seabird “La Frégate”, a fast frigate warship. 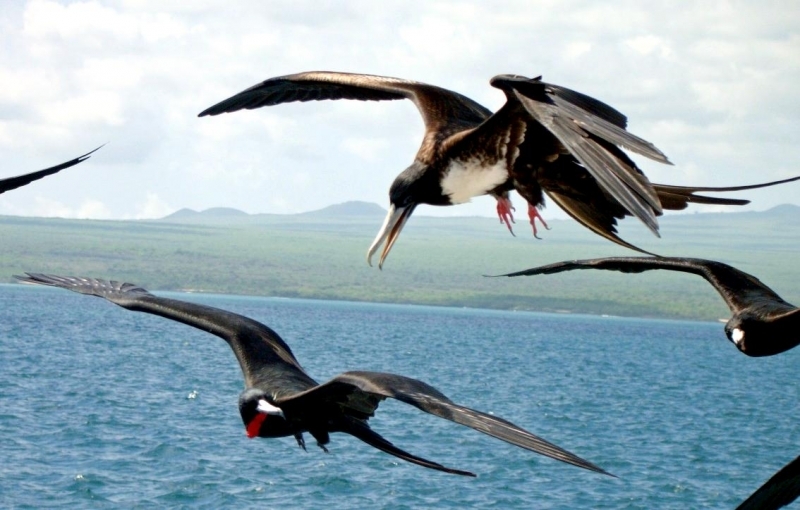 Magnificent Frigatebirds are thought to be most closely related to pelicans giving rise to another name for them, the “Frigate Pelican”. 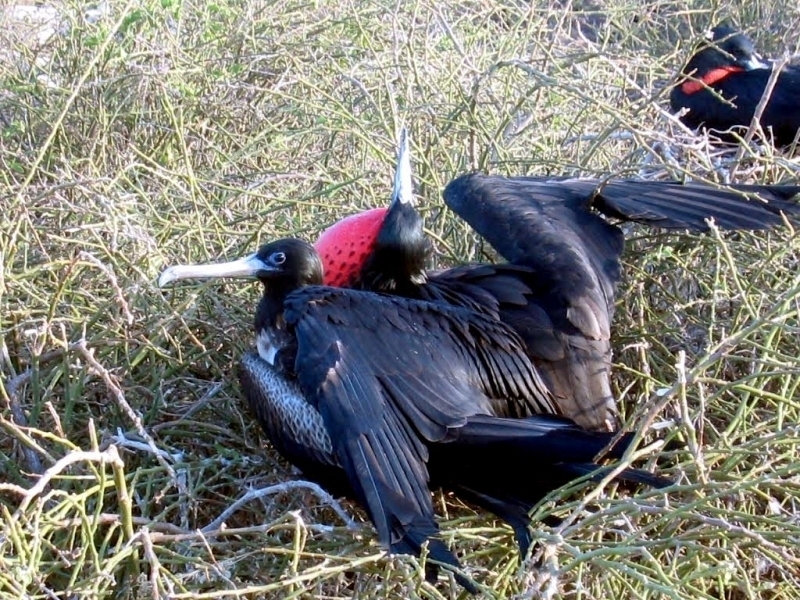 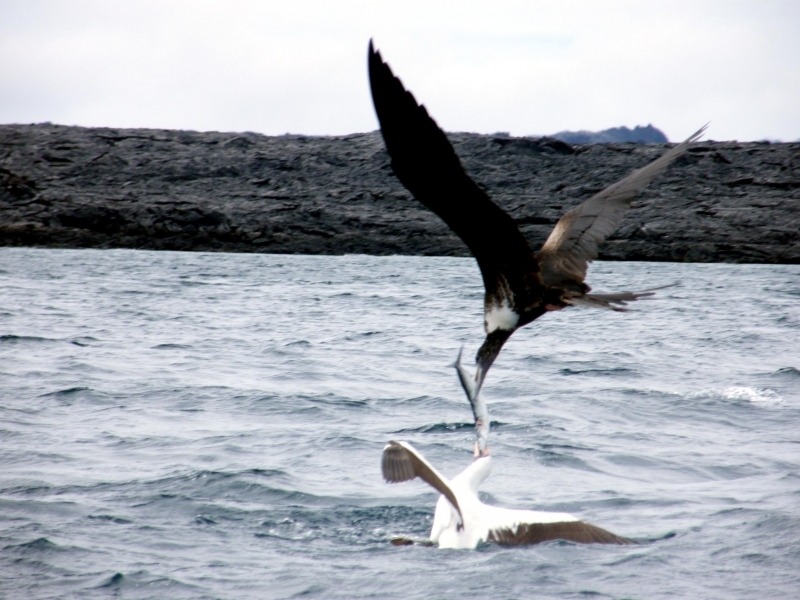 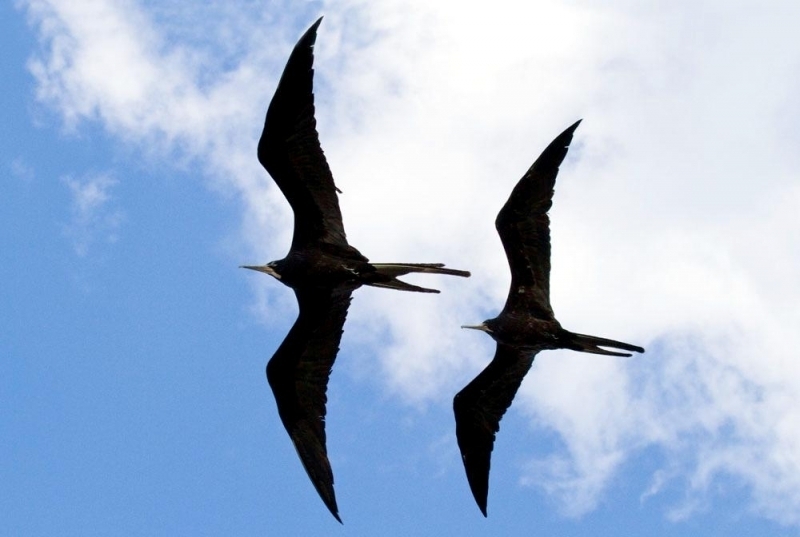 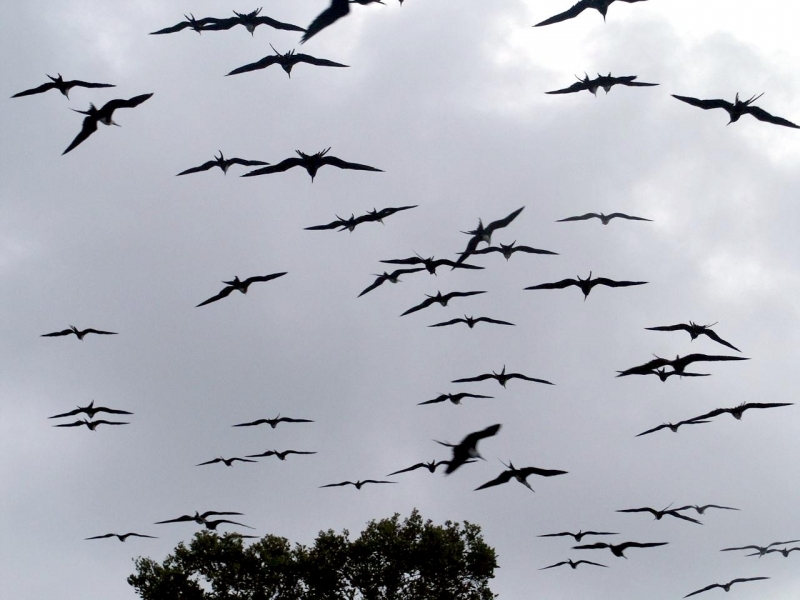 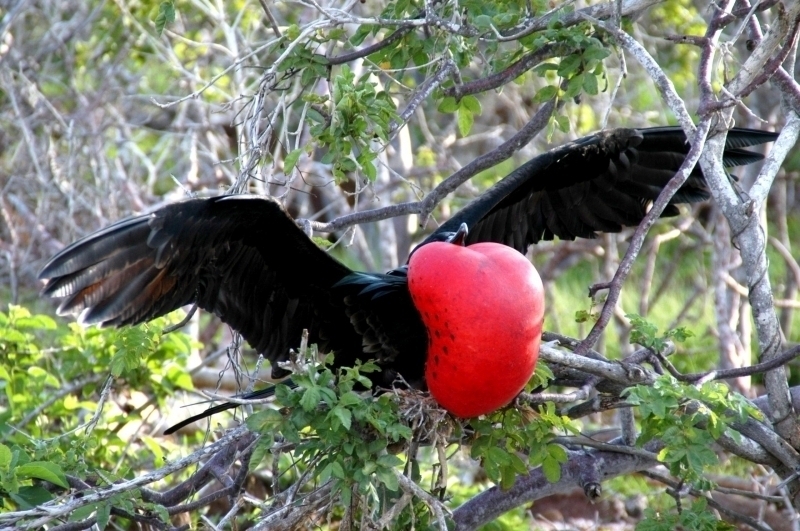 The Frigatebird has an enormous wingspan that often exceeds two meters in length. 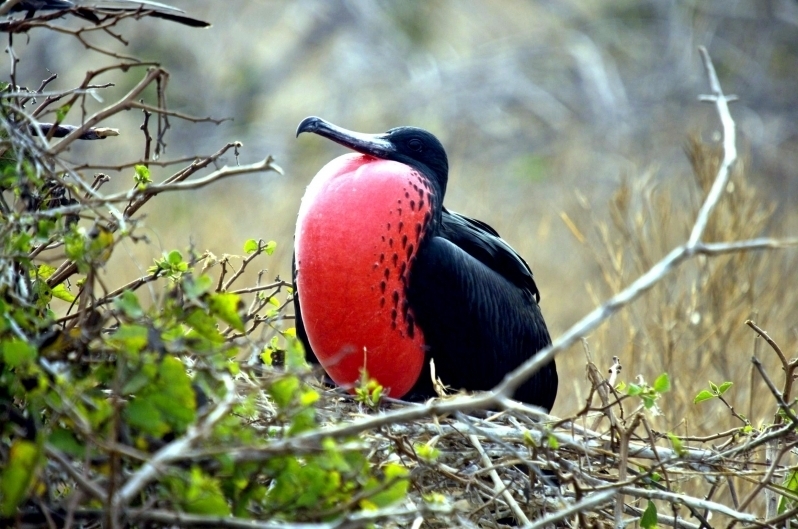 Males are most commonly known for their red throat pouch, which are inflated to attract females during the mating season. 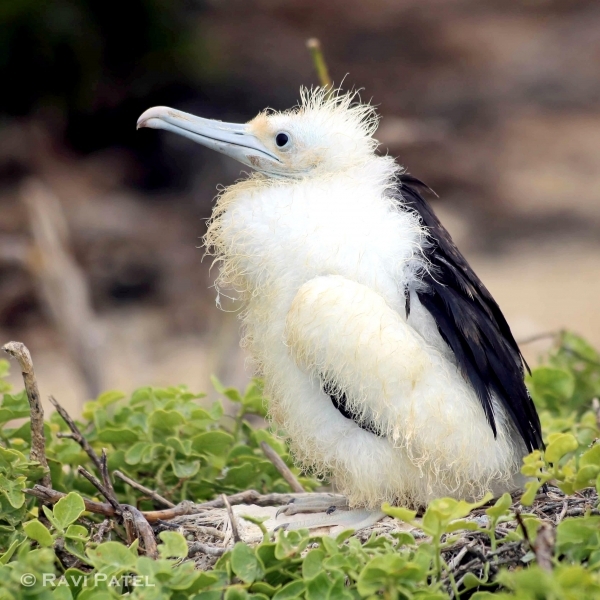 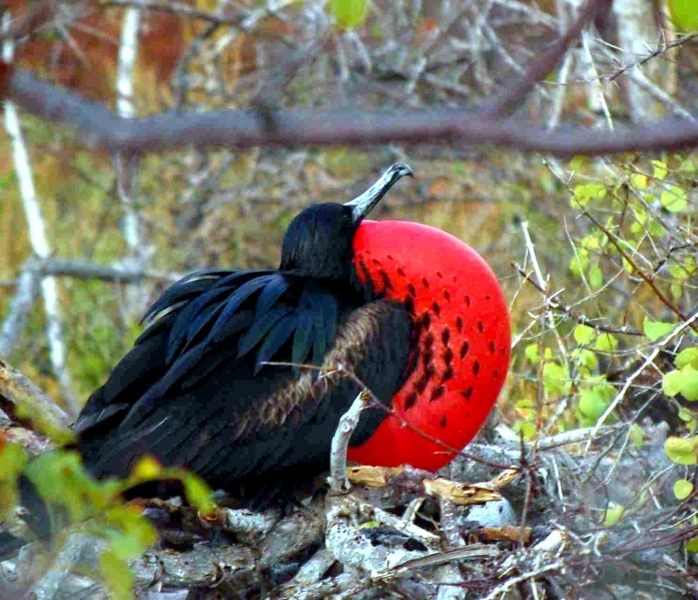 Magnificent Frigatebirds are generally black in color although some look slightly browner than black. 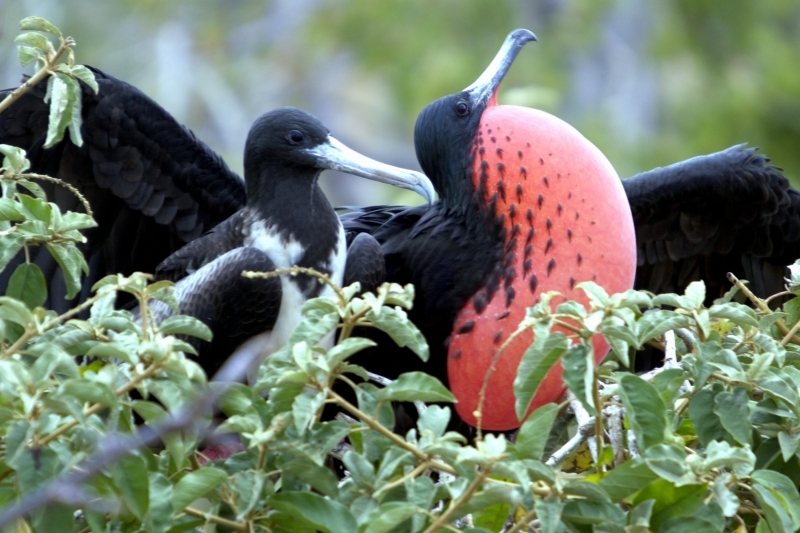 Outside of the mating season, males & females can be easily identified due to the fact that the female Frigatebird has a white patch on her underside. 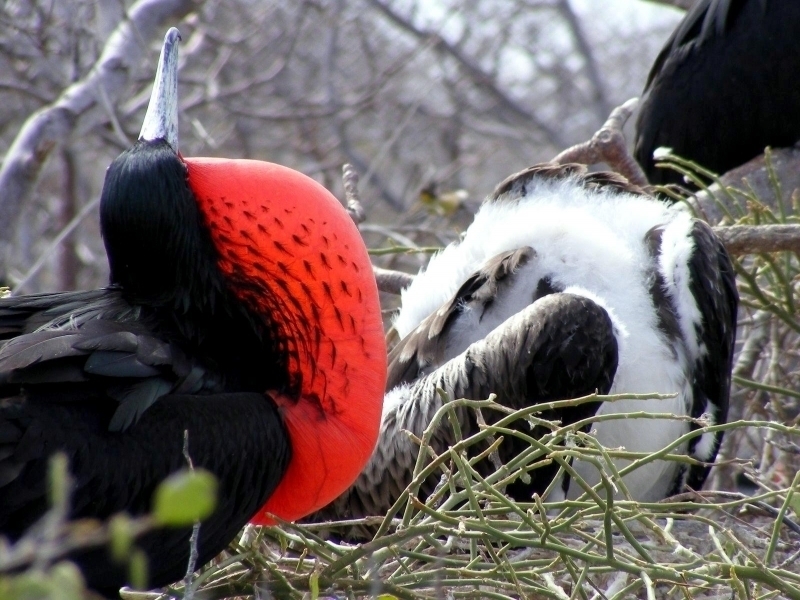 These birds nest in large colonies. 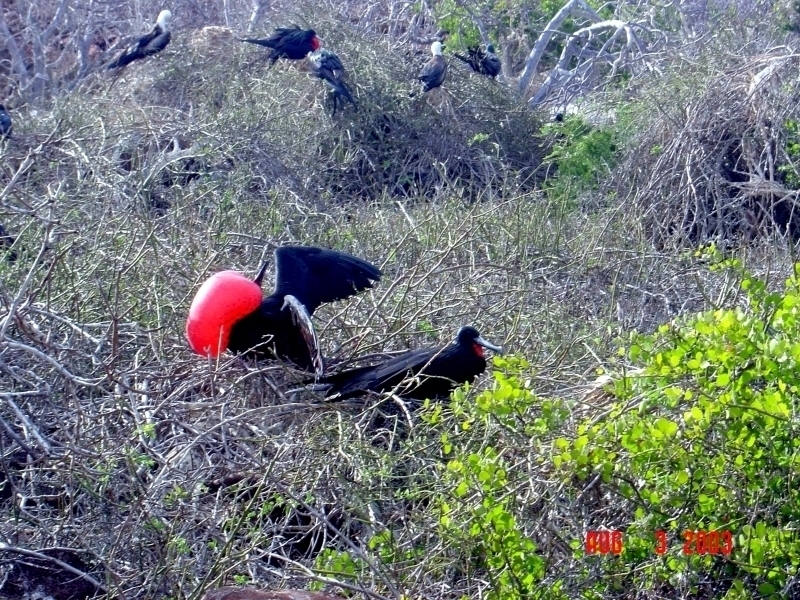 The female builds the nest and the male assists by bringing her materials. 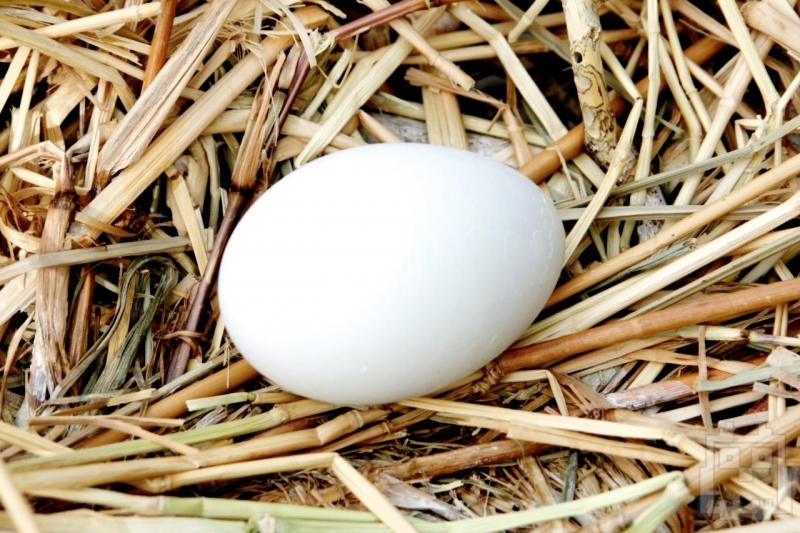 The nest is built of sticks and placed in a tree, bush or on the ground. 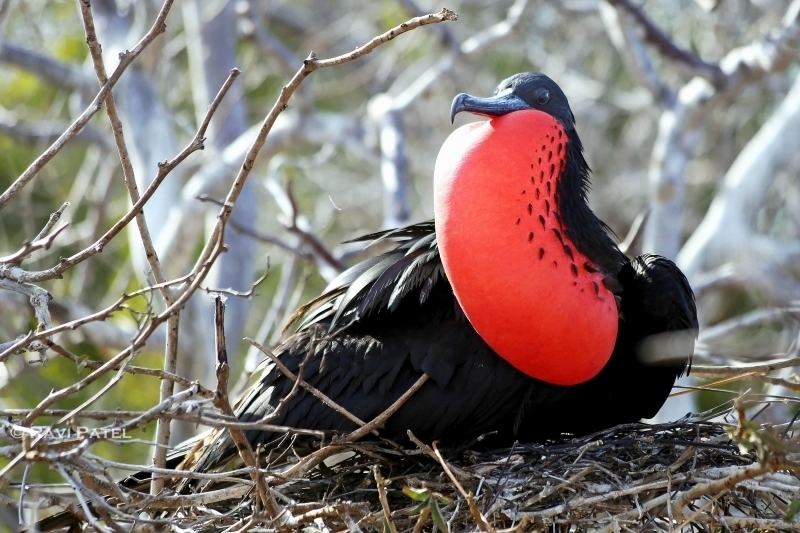 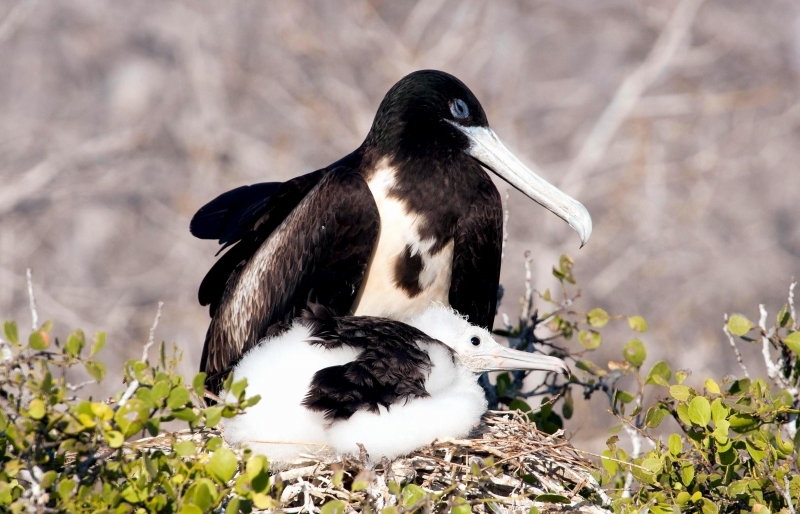 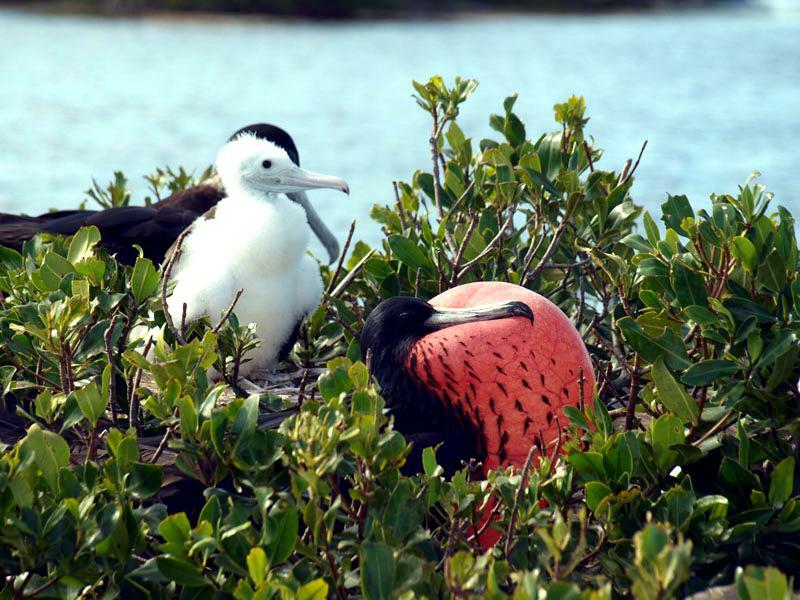 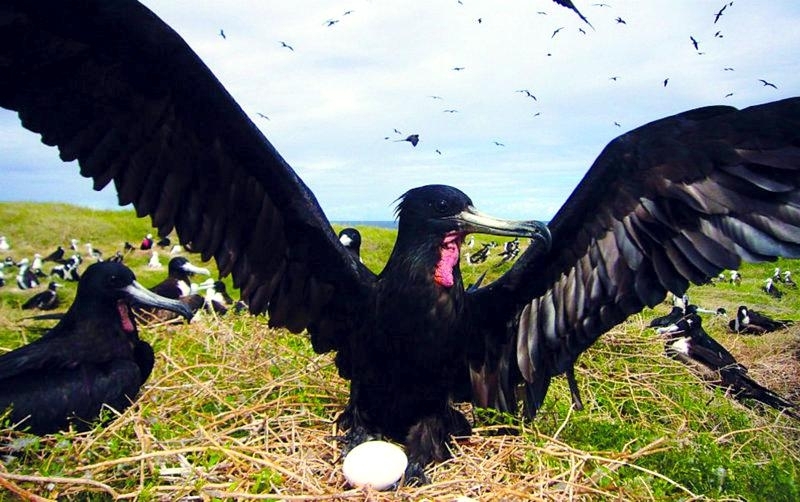 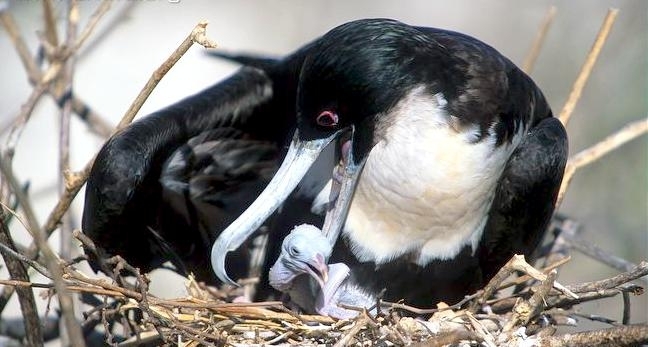 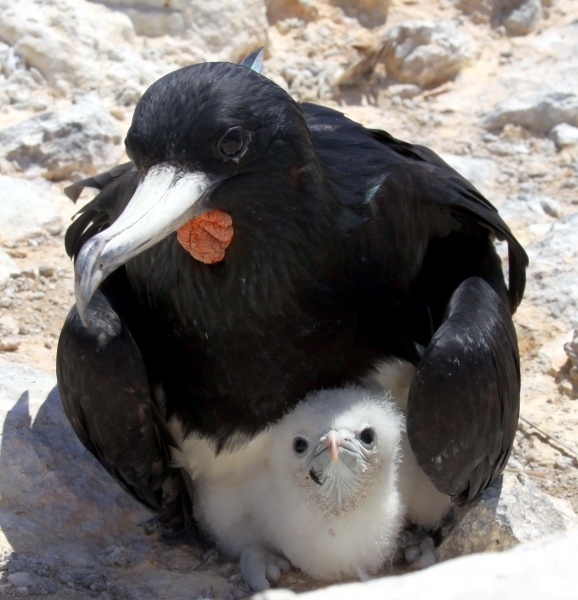 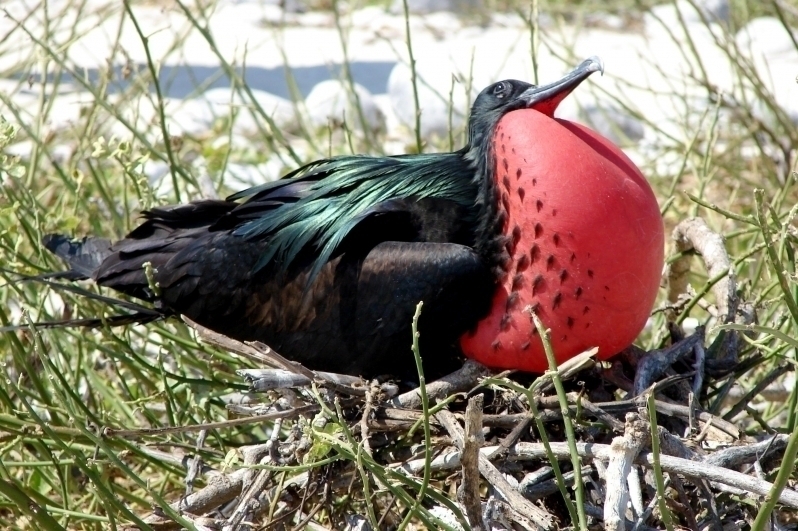 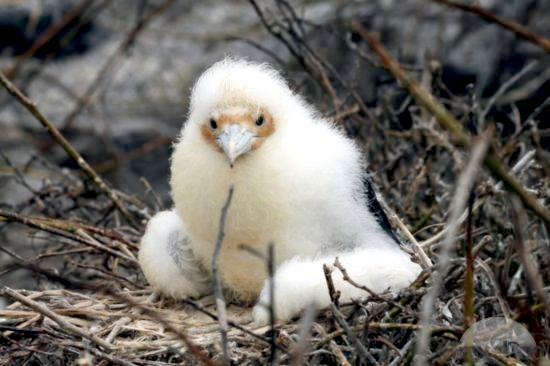 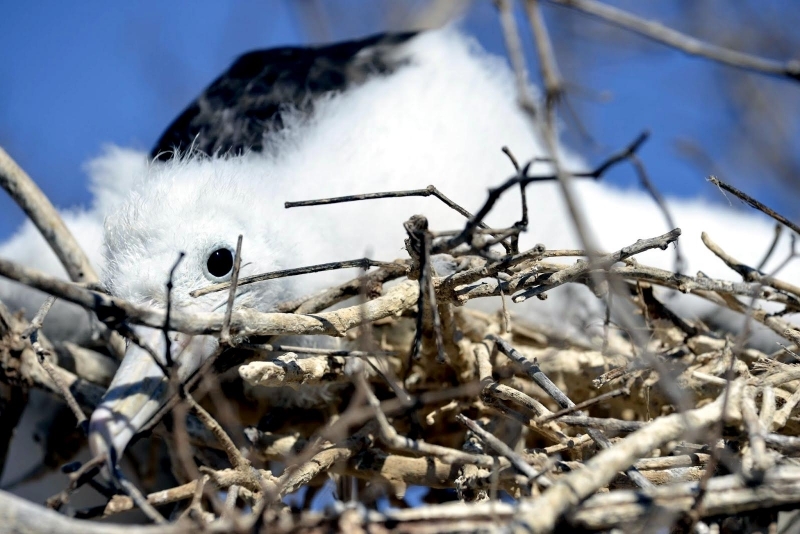 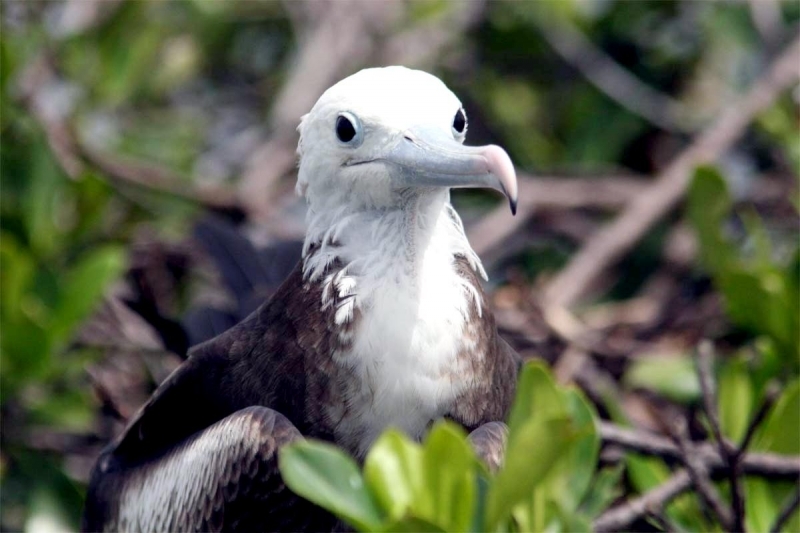 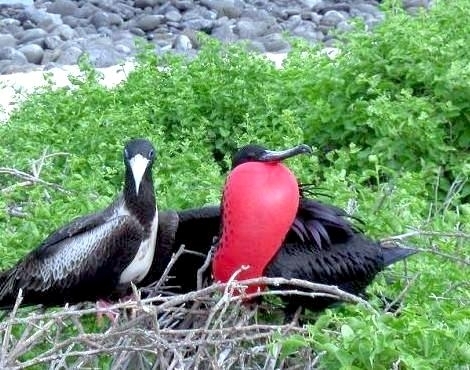 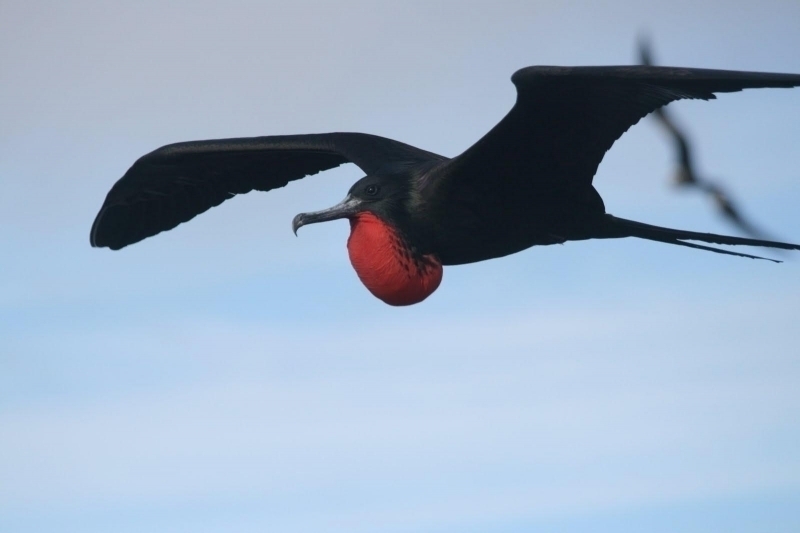 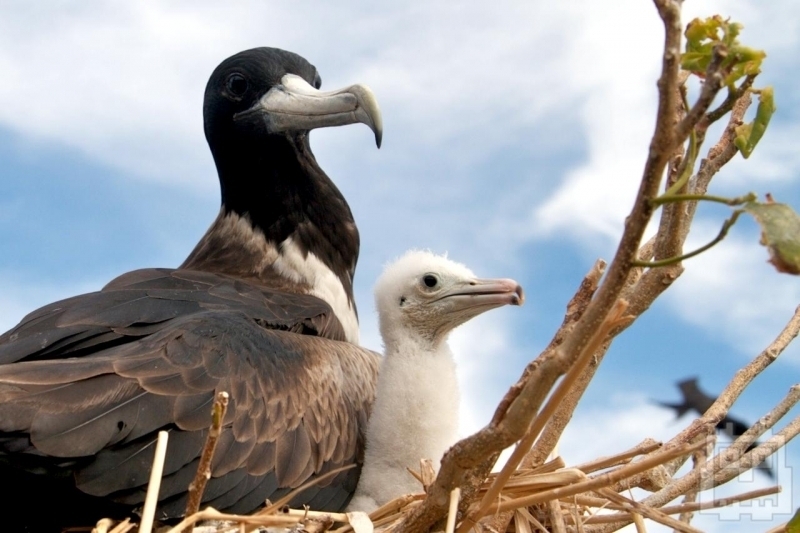 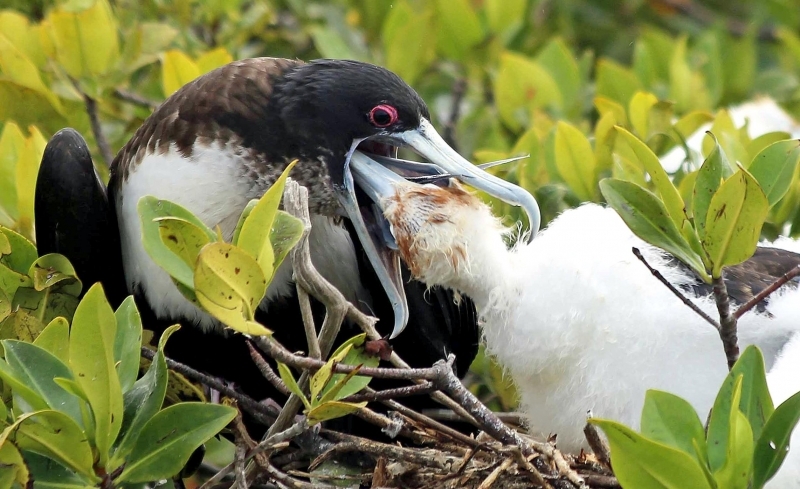 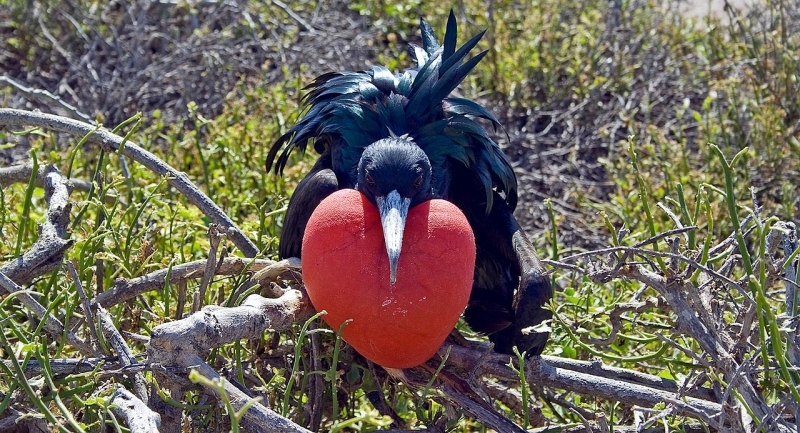 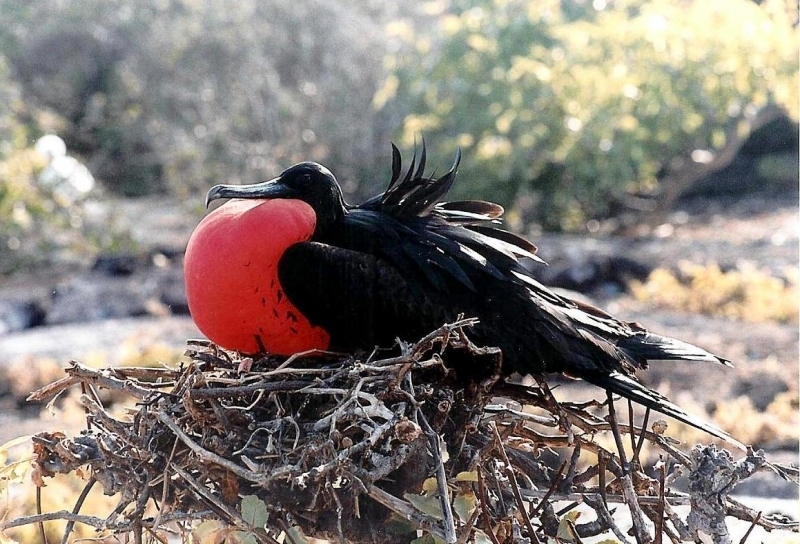 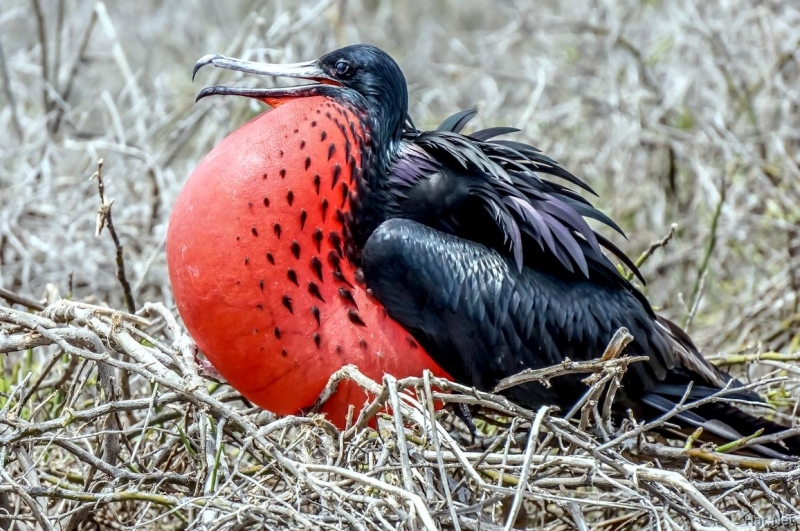 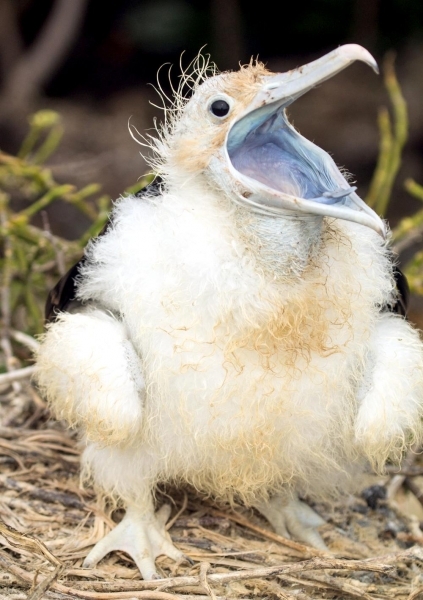 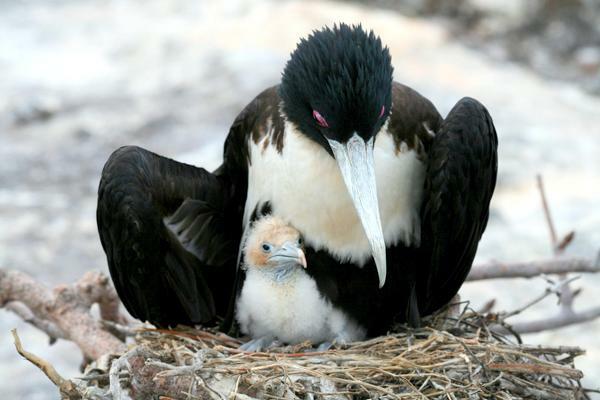 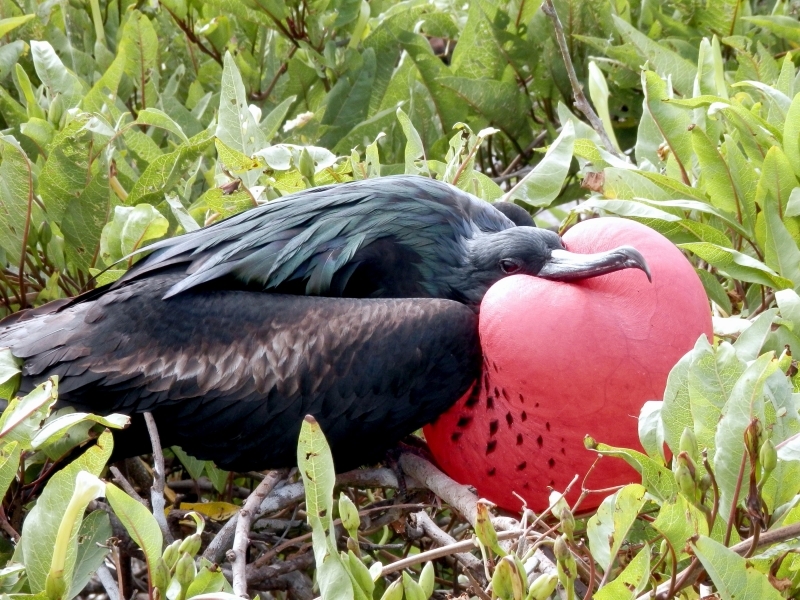 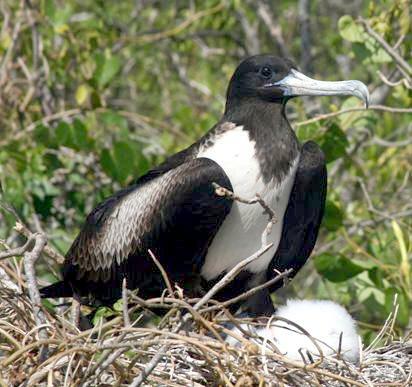 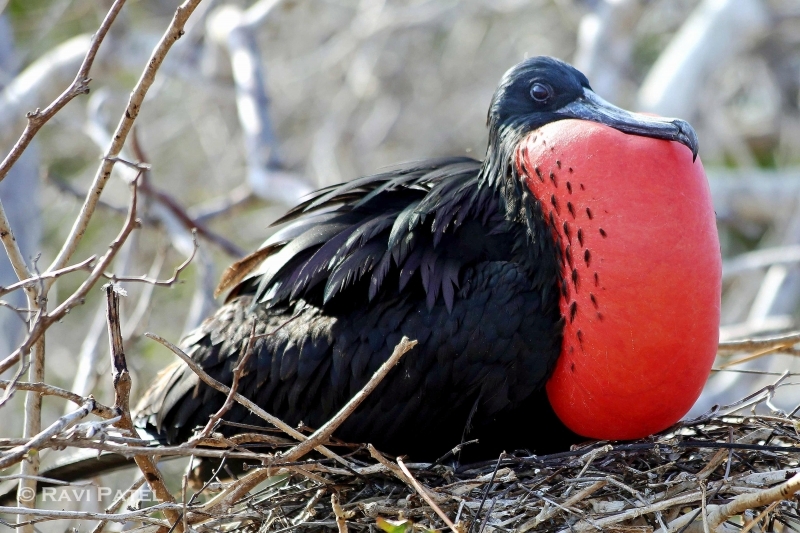 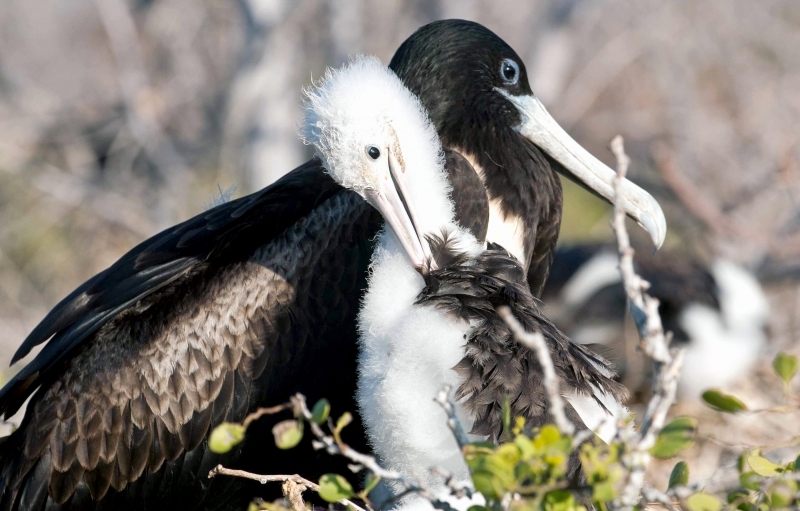 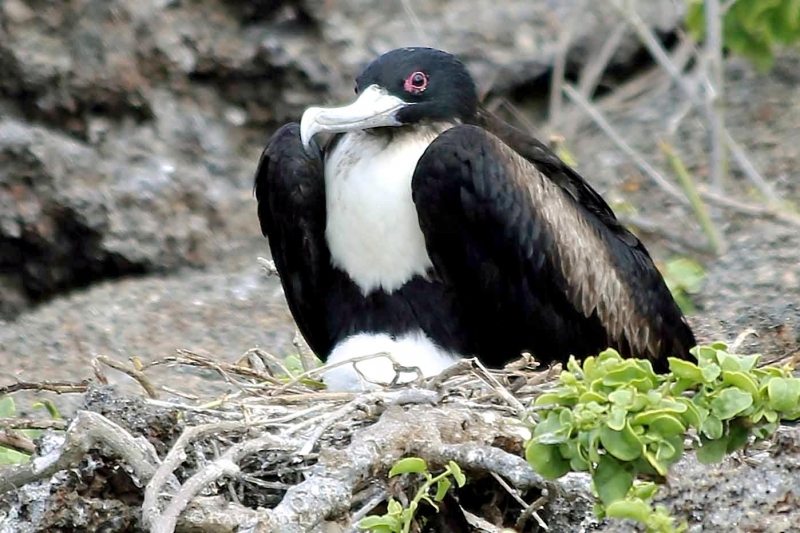 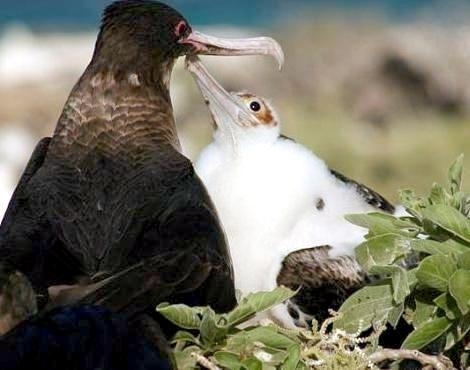 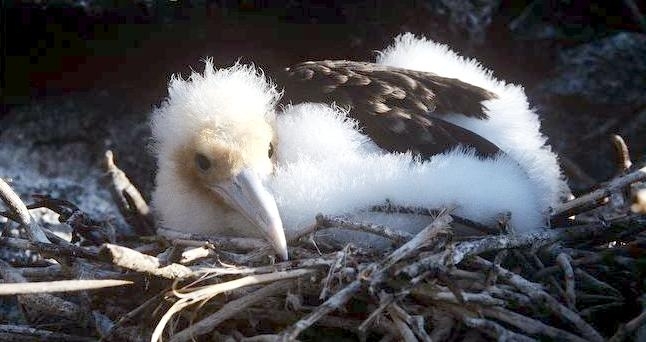 The female Magnificent Frigatebird lays only 1 egg. 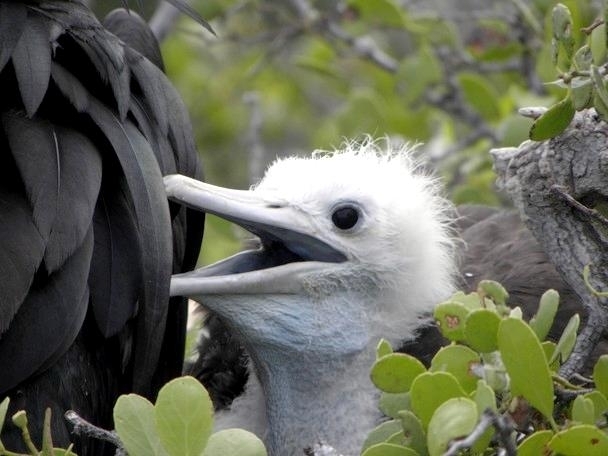 The incubation is about 50 days and it takes 6 months for the youngster to fledge. 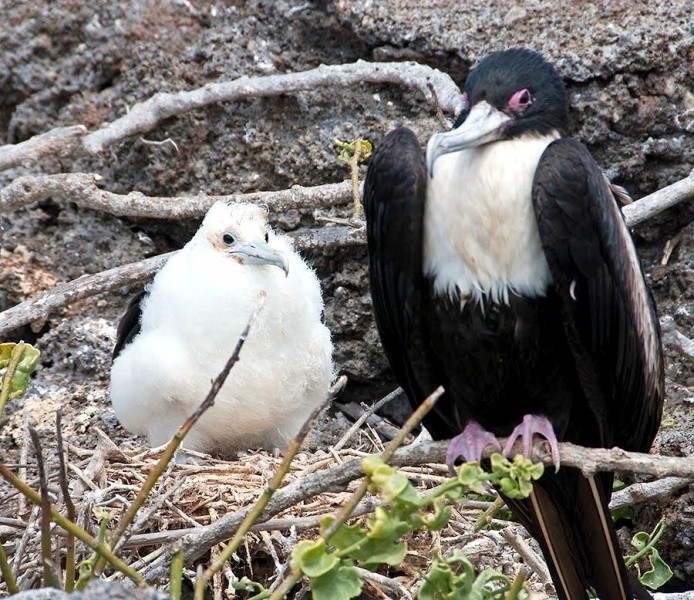 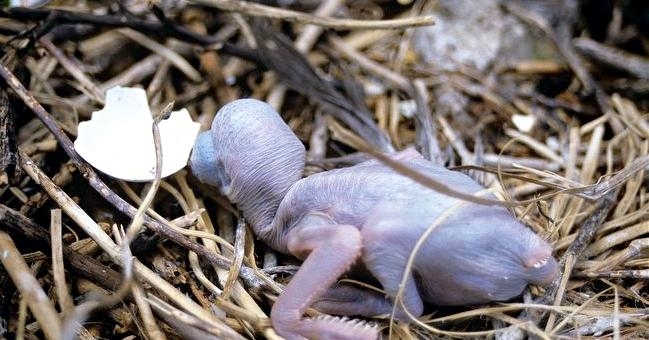 Both parents incubate and later care for the chick. 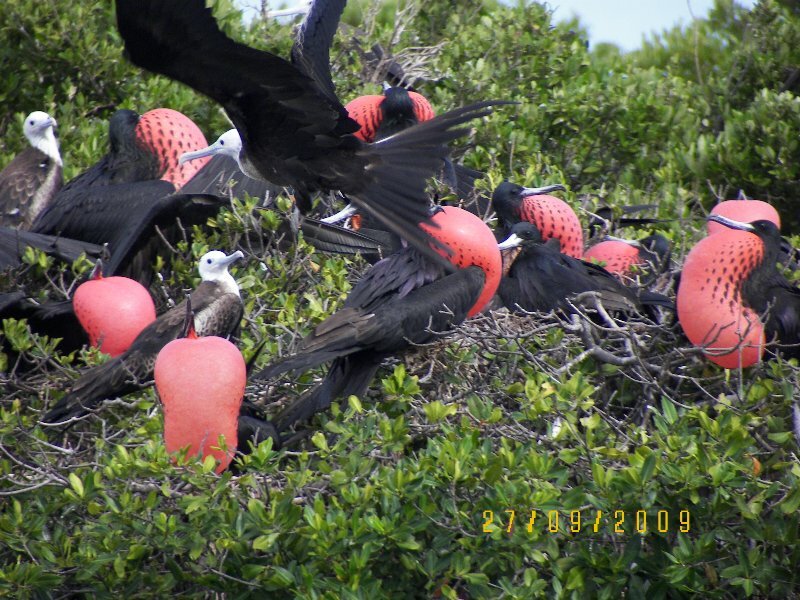 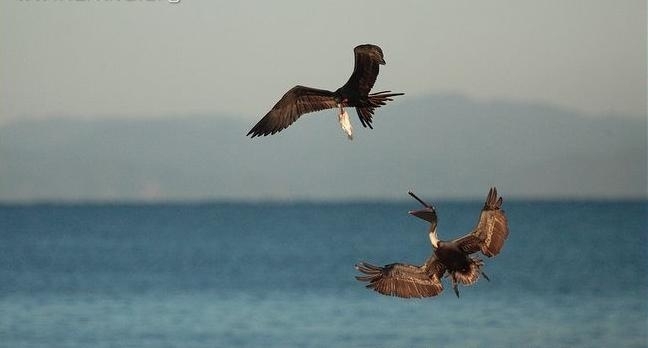 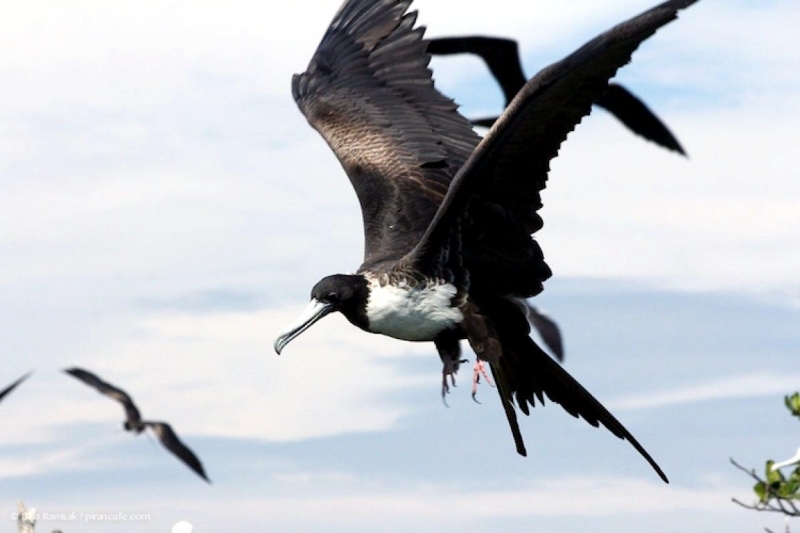 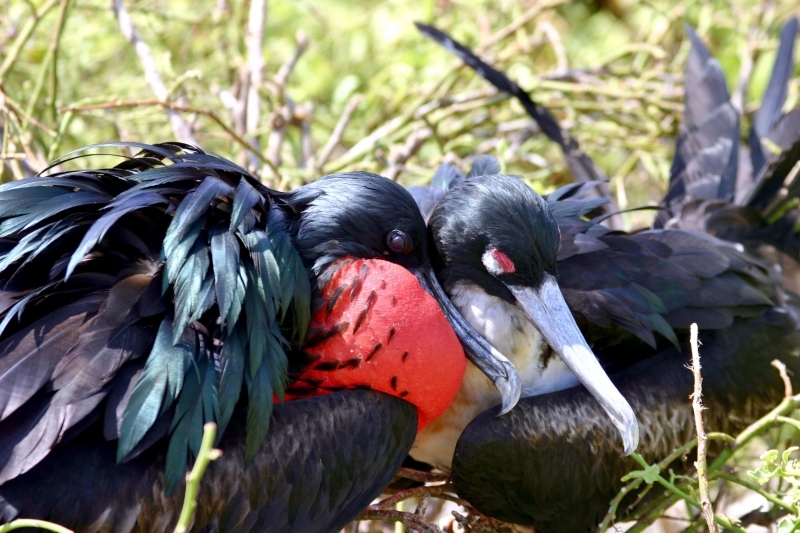 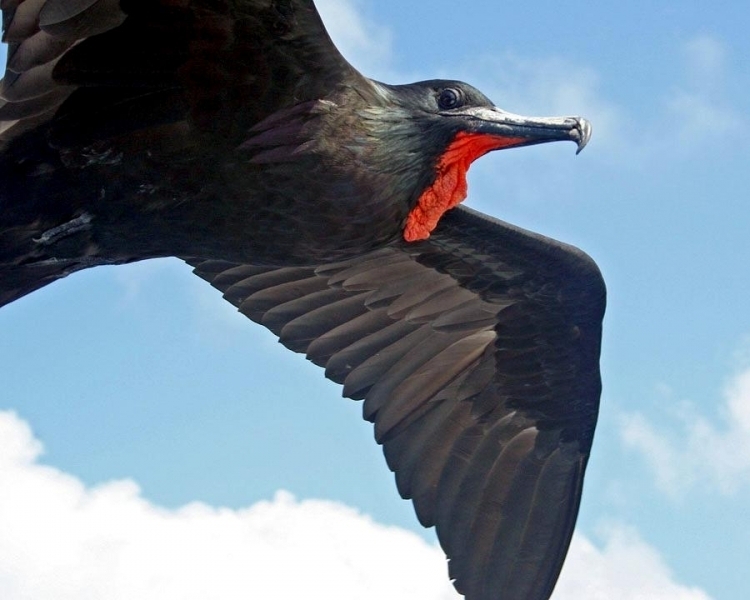 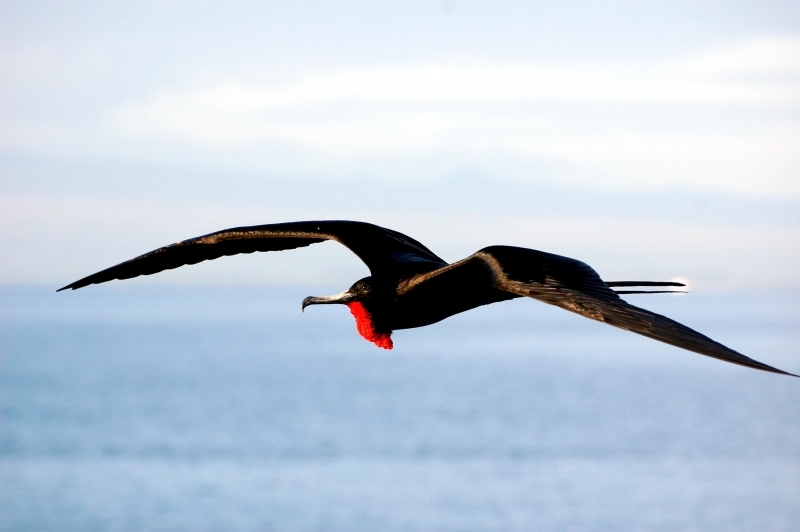 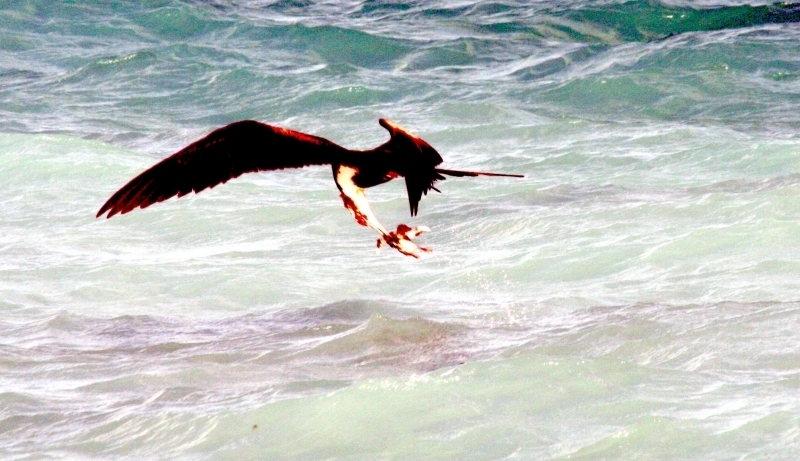 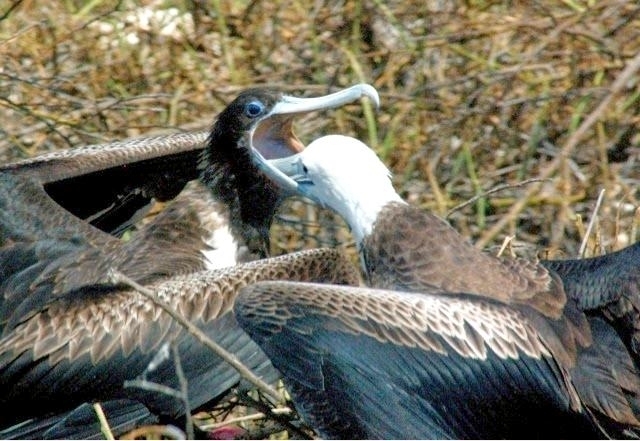 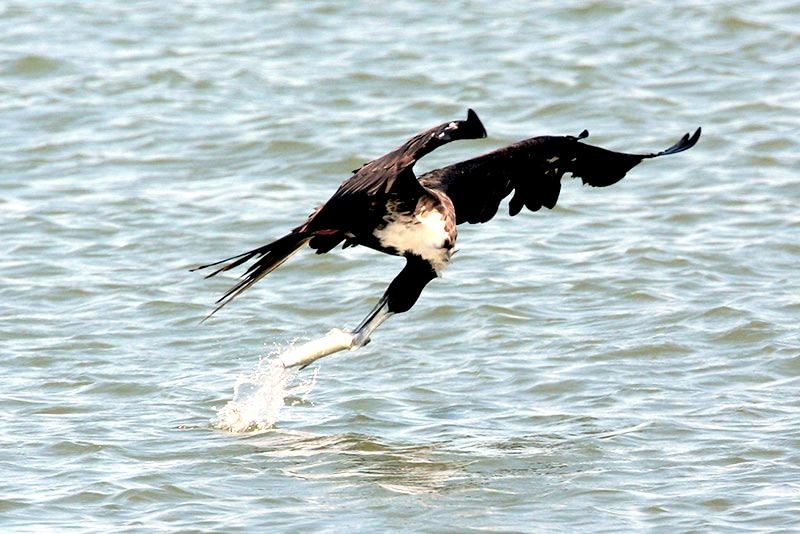 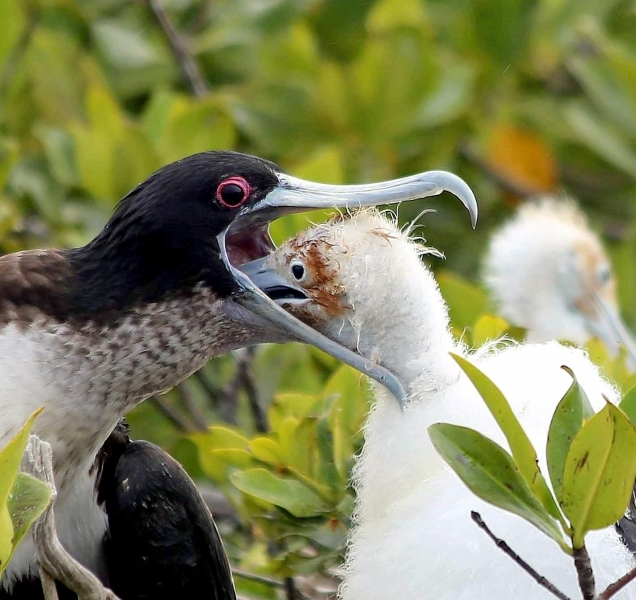 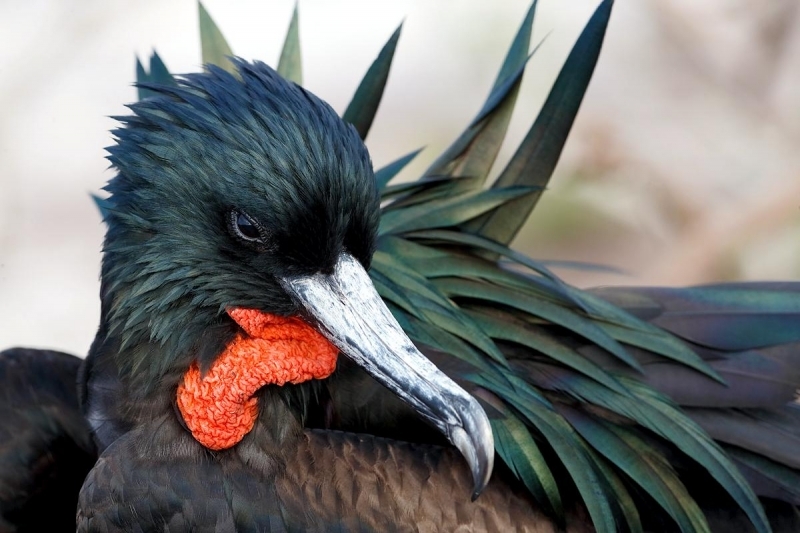 The Frigatebird feeds on small fish, sea jellies, crustaceans & squid and they will rob Terns & Gulls in flight. 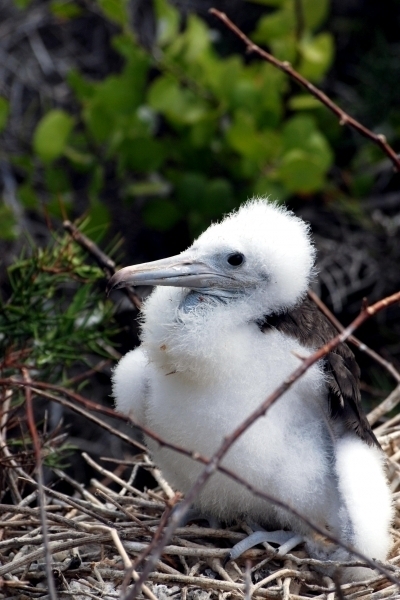 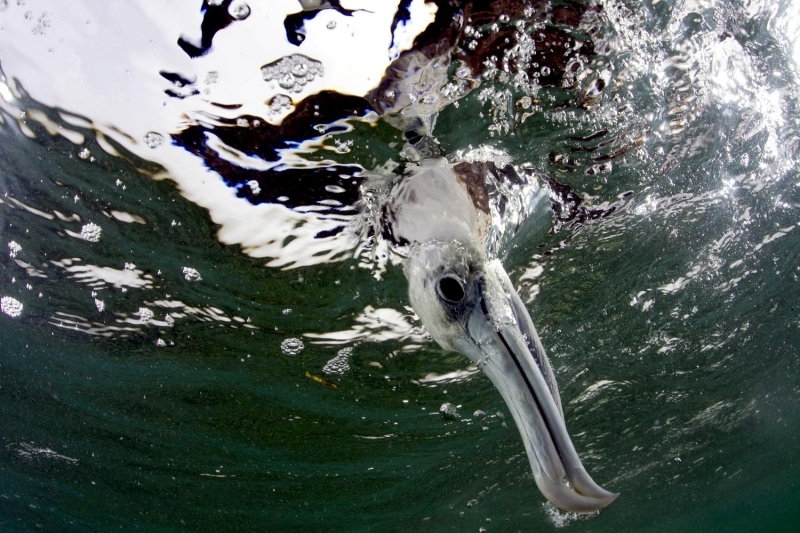 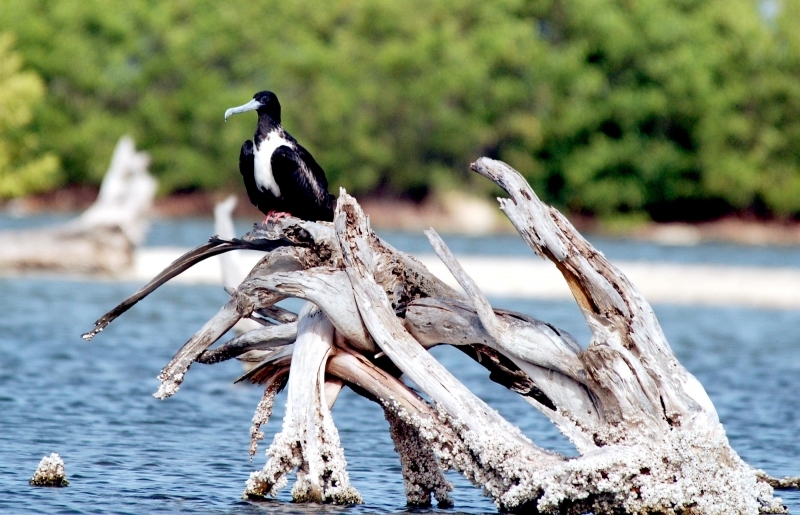 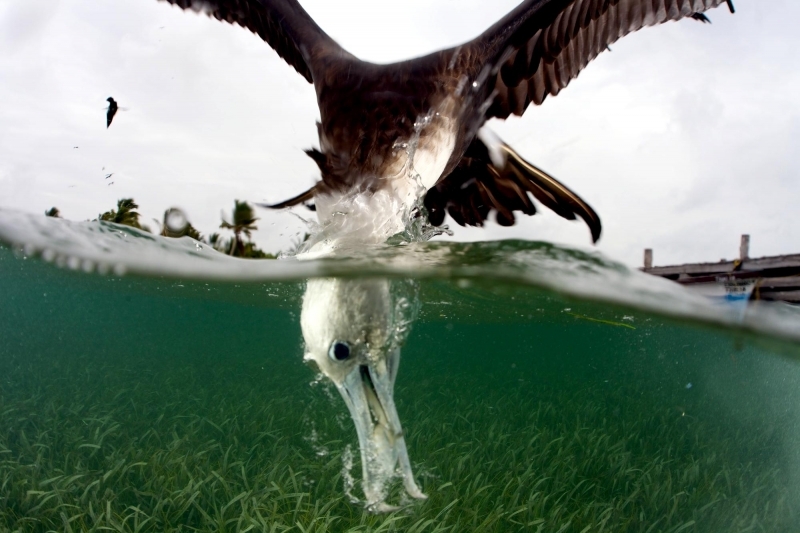 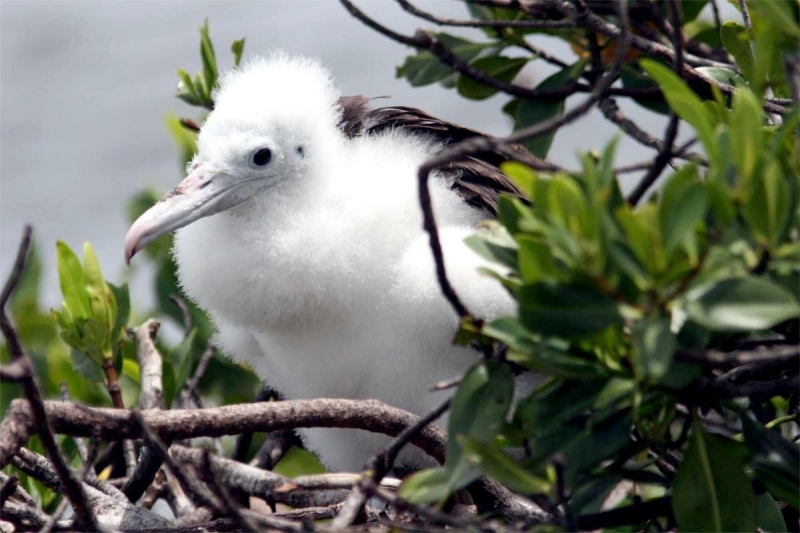 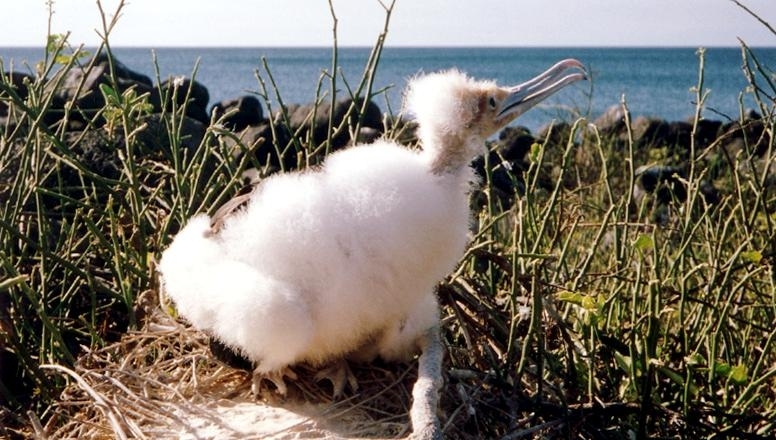 This seabird is common in the summer in the Florida Keys during breeding season otherwise it is found in North America from the Carolina coast to Florida and westward to Texas and along the California coast.